A mourning cloak butterfly basks in the sun along a Westborough's Charm Bracelet trail. The bright border on the wing attracts a bird's attention, leading the bird to attack the edge of a wing instead of the body. As the first butterfly of spring, the mourning cloak is a surprising and welcome sight along Westborough's trails. 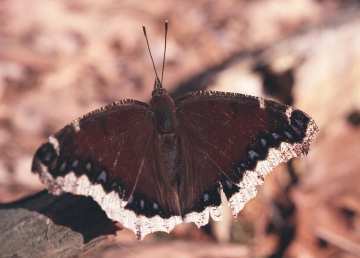 The mourning cloak (Nymphalis antiopa) has dark wings with iridescent blue spots just inside a ragged cream-colored border. This large butterfly appears in late March or April. A walk along the trails of Westborough's Charm Bracelet will take you through sunny openings in wooded areas where you're likely to see a mourning cloak fluttering past. Mourning cloaks live in the woods and seek out sunny openings where they can warm themselves. They often land on plants, open their wings and bask in the sun. The dark colors of its wings and body help to soak up the sunlight. What are these butterflies doing out so early? We think of butterflies as feeding on the nectar in flowers, but mourning cloaks feed on tree sap. They're particularly fond of the sap of oak trees. It's no coincidence that mourning cloaks appear at the time of year when the sap begins to run. You'll find that mourning cloaks are hard to spot on tree trunks, especially when their wings are folded, showing the brown undersides that blend in well against tree bark. This protective coloring helps to keep the butteflies from becoming a meal for a bird. If you do happen to see a mourning cloak on a tree trunk, it might be walking head-first down the trunk as it feeds on sap. Mourning cloaks also find nourishment in rotting fruit, animal dung, carrion, and mud puddles. We usually think of butterflies as silent, but if a predator or a person disturbs a mourning cloak, it may make a clicking sound as it suddenly takes off into flight. Where do these first butterflies of spring come from? The mourning cloaks that you see this spring spent the winter in an insect version of hibernation. As the weather turned cold last November, last year's mourning cloaks tucked themselves into small cracks in trees, rocks, or unheated buildings, or under loose bark or shingles. Safe from birds, squirrels, and drying winds, they hibernated until March or April. Like many other insects, mourning cloak butterflies undergo chemical changes in their bodies during cold weather that help them tolerate freezing during hibernation. Yet if a mourning cloak butterfly is suddenly frozen during the summer, it will die. Death comes because its body has not yet produced the "antifreeze" and other chemicals needed to protect it during freezing. Once roused from their winter hibernation, mourning cloaks seek out nourishment and mates. At this time of year, the males perch on a twig or dry plant in a sunny area and wait for a female to fly by. When a female comes along, there's a short courtship in the air. After mating, the male may continue to wait in the sunny clearing for another female. The female butterfly goes off to find the right kind of tree or shrub for mourning cloak caterpillars to feed on. Once she finds it, she lays eggs. Various kinds of willow (Salix species), American elm (Ulmus americana), and paper birch (Betula papyrifera) are among the plants favored by mourning cloak caterpillars. The eggs hatch after about 10 days, and the caterpillars immediately start eating new leaves and growing. They shed their skins four times as they get bigger and pass through various larval stages. Also known as spiny elm caterpillars, the mourning cloak caterpillars have black spines and grow to be about 2 inches long. They are black with small white speckles and a row of red dots along their back. In some parts of the country they are considered a pest of willows or elms, due to their destructive appetites. Once a caterpillar is full-sized, it crawls away from the plant it has been eating and finds a place to form a spiky gray chrysalis. (A butterfly caterpillar makes a chrysalis, while a moth caterpillar typically makes a silky cocoon.) The chrysalis typically hangs down from a branch or overhang. Inside this casing, the caterpillar transforms itself into a butterfly. After 10 to 15 days, a new mourning cloak butterfly emerges, usually in June or July. Summer is butterfly season, and the first two weeks of July are often the best time to see many different butterflies. But the new adult mourning cloaks may go into a kind of hibernation during the hottest part of the summer. They become active again in the fall, flying and feeding before they hibernate for the winter in November. The mourning cloak is one of the most long-lived butterflies, usually living 10 or 11 months. In contrast, most butterflies live only about two weeks. Mourning cloaks and other butterflies typically die sometime after mating and laying eggs. The mourning cloak was named for its dark wings, which reminded people of the mourning cloaks that were worn in earlier times during mourning. These butterflies are found throughout most of North America, in northern parts of South America, and in temperate regions of Europe and Asia.